Summer’s here and we’re scrambling for offline time to enjoy it. From roadside stands to festive events, savvy marketers shift strategies to engage us while we embrace the fleeting warm weather. For many, the season includes cycling on that timeless icon: the bicycle. From the early posters of the late 19th century, the bicycle has featured in advertising or served as a platform for it. These days, this bicycle is increasingly used in not-for-profit, advocacy and cause marketing campaigns. In fact, when anthropologist Luis Antonio Vivanco wrote Reconsidering the Bicycle in 2013, he named one chapter: “Good for the Cause” – The Bike Movement as Social Action and Cultural Politics. It works effectively as a versatile communication ‘vehicle’ that can represent many values, such as: youth, health, fitness, renewable energy, sustainability, environmental care, transportation, even enterprise. Wrapping an value-laden social or political message around a bike to carry it to a broader audience. Examples include one bike I spotted aiming to take its anti-bullying and teen suicide prevention messages over 9,000 miles, as well as another with an anti oil wars message. Visually driving a safety public service message via stationary bikes. This is something ghost bike memorials have done to a certain extent since they began in St. Louis, Missouri in 2003. Embedding bicycles in an event, such as the Bicycle Music Festival, held in San Francisco. Putting a business ‘in the saddle,’ as the Bicycle Opera Project is doing this summer to take its music across Ontario. Building a cause marketing program around a socially conscious initiative featuring bicycles, such as the Village Bicycle Project. Since 2009, The Cadbury Bicycle Factory has supported this initiative by providing more than 25,000 bikes to help children in rural Ghana get to school. I think the bicycle is as an ideal fit for offline ‘grass roots’ initiatives — but do we have to stop there? Full, integrated campaigns supported the Bicycle Opera Project and The Cadbury Bicycle Factory initiatives but others fall short of tapping the full potential. For example, after seeing the anti-bullying bike in Sausalito, California last summer, I searched for online references but found nothing. I even Googled various combinations of ‘bicycle campaigns’ to no avail. How many more people they could have reached with greater impact if they’d bumped the sign’s quality up a notch and created an online campaign to support it? Beyond cause marketing, I also wonder: Are there other ways to use this timeless icon in a for profit initiative? Maybe even in a Guerrilla campaign? 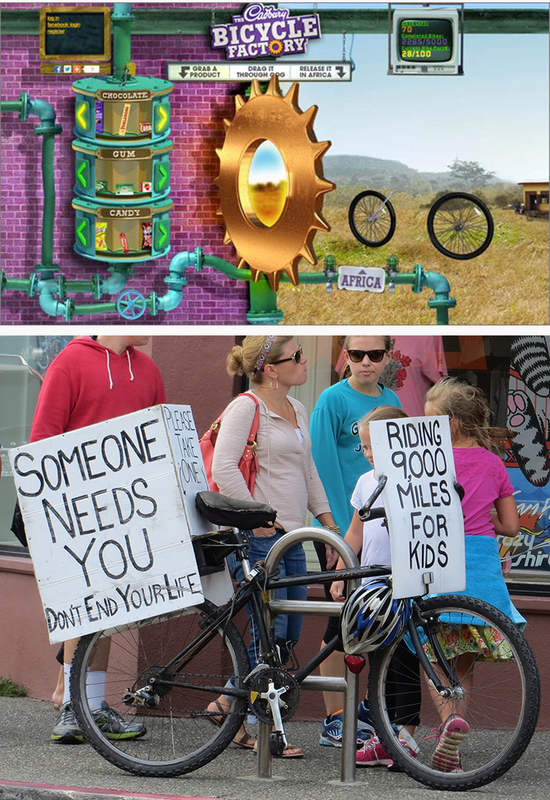 How have you seen a bicycle used to effectively drive a message, change an attitude or inspire an action? Thanks Diane for this quote and valid value to add: freedom (for women and others). This quote particularly rings true with the Cadbury Bicycle Factory example or the Village Bicycle Project itself.